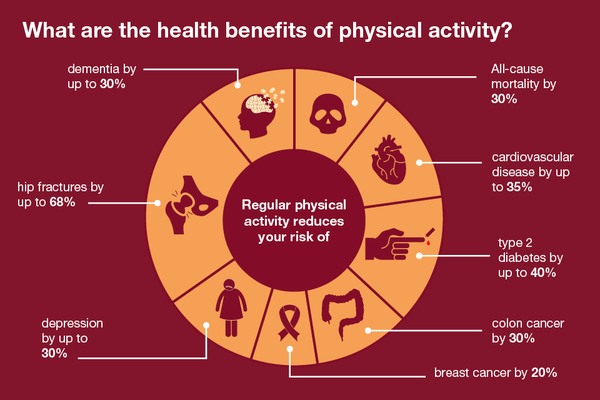 Physical activity [PA] has become a public health priority because of the overwhelming body of evidence supporting its effectiveness as a holistic health intervention. As long ago as the 1950s, Professor Morris and his colleagues demonstrated that men engaged in work requiring a level of physical activity (e.g. postmen or bus conductors) were less likely to suffer from coronary heart disease than men with sedentary jobs (e.g. bus drivers or clerical workers). Since this time, many studies in different countries and populations have demonstrated the benefits of PA in a wide variety of health conditions, in some cases showing an effect equal to or even greater than medication. 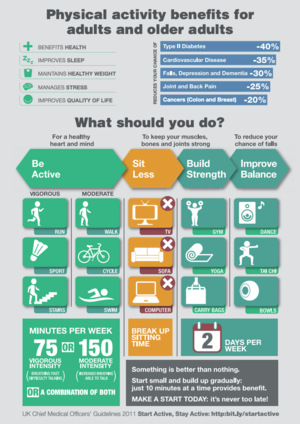 There appears to be a linear relation between physical activity and health status, such that a further increase in physical activity and fitness will lead to additional improvements in health status. Human beings are built for movement. For much of history we were hunters and gatherers and our genes have evolved to accommodate the high energy expenditure levels required to be successful and thrive in the environment. Yet in the 21st century, in many countries of the world people spend large periods of the day sitting down, whether at desks, computers or in transport; one study states "With the evolution of the development of knowledge and progress in automatic technologies, the human society gradually turned into a sedentary population. 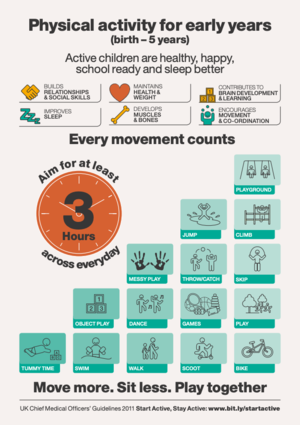 It is moreover clearly established that the physical activity is insufficient in Europe and in the developed countries. The physical activity is certainly beneficial for many reasons, but it is especially the inactivity which is dangerous." . Routine physical activity is associated with improved psychological well-being (e.g., through reduced stress, anxiety and depression). See the PA and Mental Health page for more details. ↑ 8.0 8.1 8.2 8.3 Warburton DE1, Gledhill N, Quinney A. Musculoskeletal fitness and health. Can J Appl Physiol. 2001 Apr;26(2):217-37.